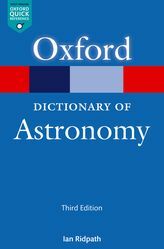 The third edition of the Oxford Dictionary of Astronomy was published online and as an eBook in 2018 February; there is no longer a printed edition. The dictionary contains some 4,300 entries on all aspects of astronomy, astrophysics, and space science, written by a team of specialist contributors, both amateur and professional, under my editorship. The size of the Dictionary has steadily grown since it was first published in 1997, when it contained nearly 4,000 entries. A heavily revised version appeared in 2003 in which the number of entries increased to over 4,000. In 2004 that revised edition was reprinted with further updates, mostly concerning space missions and observatories. A second edition of the Dictionary was published in September 2007. For this, all entries were reviewed by a team of specialists, mostly different from those who had written the original entries. A new departure for this edition was the inclusion of URLs of websites, notably for space missions, observatories, various other institutions, and online catalogues. This 2007 second edition incorporated over 160 new entries, although some existing minor ones, particularly for small planetary satellites, were deleted. A revised version of the second edition appeared at the start of 2012, reset and with a new cover. It introduced over 50 new entries and a new table of planetary data, while nearly 500 other entries were revised and updated. In this edition the URLs were moved to a dedicated web page which also included links to over 100 illustrations. The third edition was fully revised and updated, adding over 80 new entries. It is updated online as necessary. Have you found anything that needs changing? If so, please send me an email. Page last updated 2018 February.